The small size and light weight of Mininfra Scan-TPlus® grain analysers make it possible to use the device on more locations, on the farm, or even on the field. Mininfra Scan-TPlus® is delivered with a metal case in order make the transportation safe and easy. The device can be operated at 12V power supply too, e.g. powered by a common cigar lighter of a car. The large, colour touchscreen of Mininfra Scan-TPlus® grain analyser as well as the clear and logical menu system make the everyday use of the device very simple. For different kinds of grains (different kernel sizes) belong different sample holders (cuvettes) for sample presentation. The sample holders of Mininfra Scan-TPlus® are robust, easy to fill, empty and clean. 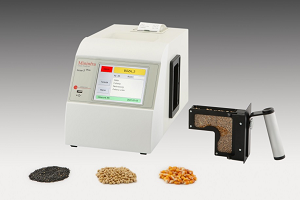 Mininfra Scan-TPlus® grain analysers are delivered with one 18mm sample holder and calibrations for wheat barley, rye, durum, etc. by default.